Hi, I am Dr. Brion Weinberg and this is Weinberg Dentistry blog. In today’s post, I would like to discuss mouthwash. Many Juno Beach residents use mouthwashes to freshen their breath and help retard tooth decay. Mouthwash should never be used exclusively though, good oral hygiene starts with a thorough tooth brushing followed by flossing. Mouthwash is just a supplement in your dental hygiene tool box. It is important for Juno Beach residents to know what kind of mouthwash they are using. 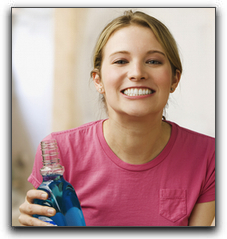 Some mouthwashes merely mask bad breath while others help reduce the bacteria that causes plaque and bad breath. If you are one of the Juno Beach residents that suffers from bad breath it is important to choose a mouthwash that contains ingredients that help prevent tooth decay such as fluoride. But folks also need to use caution when using mouthwashes because many of the ingredients are dangerous when the recommended amount of mouthwash is exceeded. At Weinberg Dentistry, we want everyone to have great smelling breath, but to use caution when treating their bad breath. Make sure to read your mouthwash label and follow all instructions given. In addition to preventative dental care, Weinberg Dentistry offers a wide range of cosmetic dentistry procedures. If you are a resident anxious to have a whiter, brighter smile, Dr. Brion Weinberg offers various teeth whitening options. Weinberg Dentistry also provides cosmetic & emergency dentistry as well as sedation dentistry. At Weinberg Dentistry we have been improving the smiles of residents in Juno Beach and the surrounding areas since 1999. Contact us today to schedule a cosmetic dentistry consultation.